Can a simple thing like a well while functioning as a well (well what else!) be beautiful as well? Meet Chand Baori- Built-over a thousand years ago, the step-well of "chand baori" in Rajasthan is still an architectural mystery. 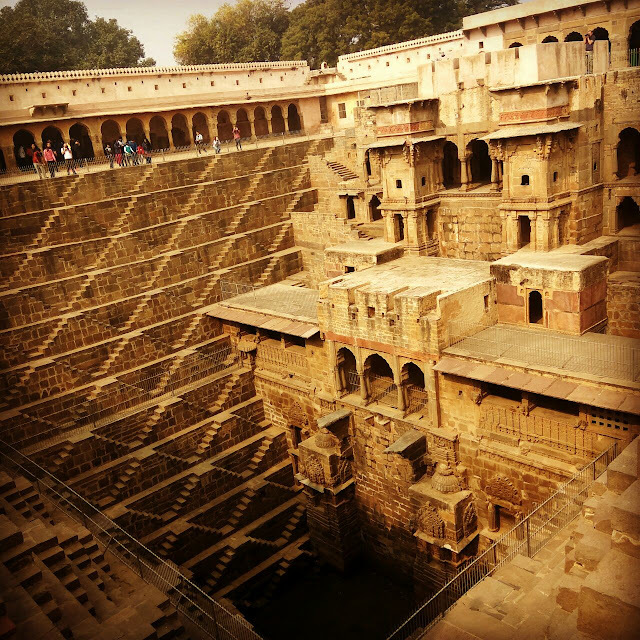 It is one of the largest stepwells in the world and also one of the, if not the most beautiful ones. Composed in a perfect square geometry with steps on three sides and living quarters penetrating into the earth on the fourth side, creates a magical maze and precise geometric pattern which evokes interest and curiosity in the viewers. The ancient idea to create a comfortable living environment during the days of harsh sun, led to building this cellar rooms which have an in-built temperature control system. The square geometric pattern is repeated into 3500 steps which go down deep into the water-tank. The steps are designed to create a pattern that evokes a different play of light and shadow at every point of time during the day. The pavilion / living quarters on one side is beautifully decorated with Jharokhas and arches, to give a spectacular view. There are access doors from inside the building on to the platform created at intermediate levels inside the well. However the question of how the structure was constructed with strong retaining walls and efficient waterproofing system is a mystery. The geometry of the structure could be one of the reason for its stability. Can this marvelous structure be reused and adapted into any modern use rather than keeping it as an unattended heritage monument, least maintained? Since last few years the location have been in the hot-list for movie directors from across the globe but was the glory and mystery of the spot have been completely captured in the big screen.? Can the place be converted into a dramatic wedding destination or a performance theater with minor alterations.? functionality fʌŋkʃəˈnaləti/ noun 1. the quality of being suited to serve a purpose well; practicality. aesthetic iːsˈθɛtɪk,ɛsˈθɛtɪk/ adjective 1. concerned with beauty or the appreciation of beauty.